Exploring the marine world at night under torchlight offers a different and dazzling way of experiencing the eternally beguiling underwater landscape. Why on earth would you want to go diving at night? It’s a question commonly asked of divers who undertake their underwater escapades after the sun goes down. After all, if diving is an activity associated with exploring the wonders of marine life under the waves then wouldn’t it defeat the object if you can’t see anything? Night diving is not done in the pitch black of course, but with illumination provided by torchlight. But even so, what is the actual benefit of diving at night? Like any inhabited environment, whether it’s the forest or the city, the sea is a very different world at night. Nocturnal sea creatures not visible during the day emerge from their hiding places to go hunting, while others hide away in basket coral or under rocks. And such sleeping creatures may include things that are unapproachable during the daytime. Under torchlight, the creatures and habitats themselves also appear different. The underwater seascape can appear like a technicolor wonderland - the colours of reefs are vivid and dazzling, corals emit a luminous glow and fish appear translucent. 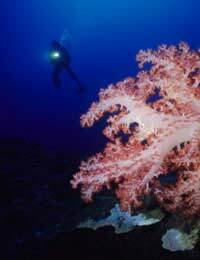 Not surprisingly, night diving is not suitable for first time divers because increased hazards such as visibility and directional problems have to be taken into account. Still it is hard to believe that any beginner would want their introduction to diving to start with a night time descent into freezing, inky black waters. The Professional Association of Diving Instructors (PADI) run a specialised Night Diver qualification, and the British Sub Aqua Club (BSAC) also have a space for it on their Advanced Diver programme. The one key extra piece of kit for the night diver is the torch. Generally speaking, the best underwater torch is one with a small light but intense beam. The torch should also be weighty enough so that if you put it down anywhere it doesn’t float up to the surface. Nevertheless, it should always be equipped with a lanyard to keep it at close quarters. It is important never to shine the torch in the face of another diver. It takes around 15 minutes for people to get used to low light levels and by shining a light directly in someone’s face you effectively ruin their night vision for another 15 minutes. It is for this reason that head mounted dive lights are not allowed. It is essential to take along a back up torch for any night dive in case the primary device is damaged, lost or just goes out unexpectedly. This can be smaller than the main light. It is worth remembering that even if every one of your lights fail, it is unusual for it to be completely black underwater at night. You should be able to pick up the illumination from the stars and moon once your eyes become accustomed to the low light levels, particularly in shallow waters. The location would not be entirely unfamiliar anyway, as night dives should always take place somewhere where you have experienced during the daytime. This reduces the risk of getting lost. Nevertheless, your night diving training will have taught you about underwater navigation and how to use a compass effectively. If you are diving from a boat then the divemaster will need to be able to locate you in case you cannot swim back to the boat for whatever reason. To enable this, they will request you attach either a chemical light stick or battery-powered marker to your snorkel. A charter boat will also normally hang a torch or flashing beacon off their anchor line to help you to keep your bearings and help you return back to the boat at the end of the dive.